Children's Healthy Smile Project has identified multiple areas of critical need in the prevention of dental disease. Dental disease starts early in a child's life. Prevention and education must also start early, with a baby's first tooth. This project will provide dental hygiene information to new moms. Emphasis will be on early care, starting before the eruption of the first tooth. Additionally, the effects of "baby bottle syndrome", thumb-sucking, pacifiers and especially diet, will be included. As a child grows and teeth are formed, dental disease prevention becomes paramount. Busy moms, childcare workers and teachers need to establish a healthy oral hygiene routine and healthy diet. Proper brushing with toothpaste designed for toddlers is necessary. For the older preschool child a flosser can be introduced. Head Start, Low income Kindergarten and elementary school children are the most vulnerable to dental disease. Dental caries (tooth decay) is the single most common chronic childhood disease – 5 times more common than asthma and 7 times more common than hay fever. Over 50 percent of 5- to 9-year-old children have at least one cavity or filling. This affects every aspect of a child's life. Pain and suffering due to untreated diseases can lead to problems in eating, speaking and attending to learning. Early oral hygiene education and supplies such as toothbrush, toothpaste and floss are needed. In addition to Smile Kits, Children's Healthy Smile Project, has been providing children's textbooks relating to dental health issues to the Head Start classrooms we have been supporting. Examples of the texts are illustrated in the image below. Teachers read them in the classroom and allow the children to take the books home to be read by their Parents. This project has been well received and the teachers have selected the books as their favorites. Also, not shown, similarly themed textbooks are provided in Spanish. 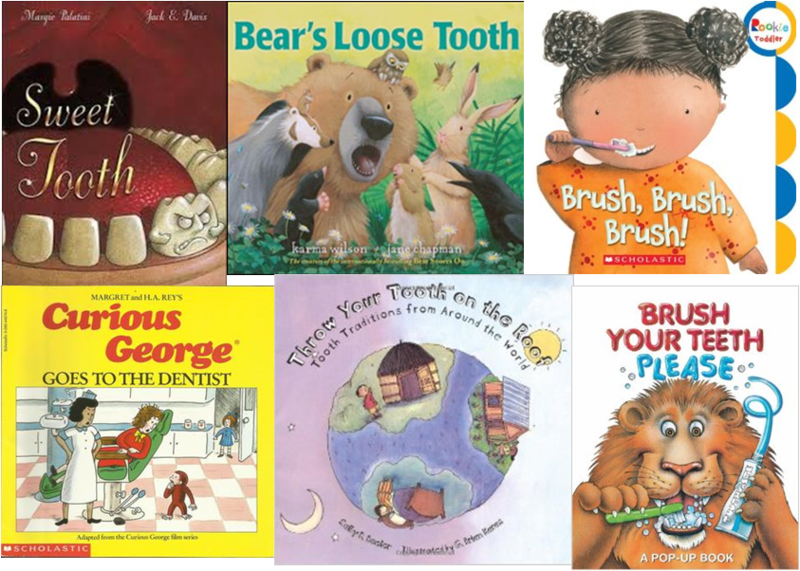 We are pleased to work with each Head Start to provide materials which support education and make the children comfortable with going to the Dentist. 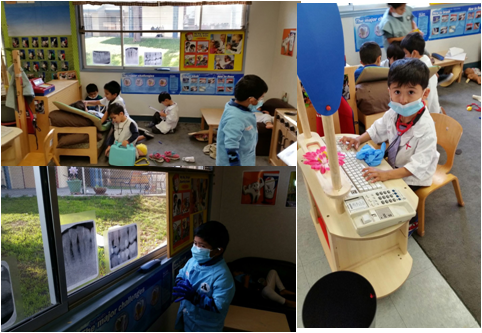 Our local Head Start was provided lab coats, masks, bibs, ... to role play Dentists and promote oral hygiene. This overall experience improved the children's knowledge and promoted healthy habits. Coming Soon: Children's Healthy Smile Project is partnering with Optic Dental to offer access to the latest advance in technology, TeleDentistry, for under served children with minimal access to a dentist. 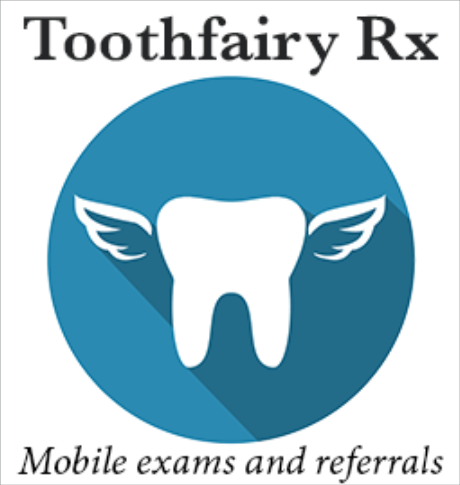 Toothfairy Rx , provides access to a dentist and referral to public agencies for care. A smart phone is used to take pictures of problem areas (using the Toothfairy Rx App) which are reviewed by a licensed dentist and a report issued within 24 hours. A introductory rate of $.99 is available, promo code 2THDR. 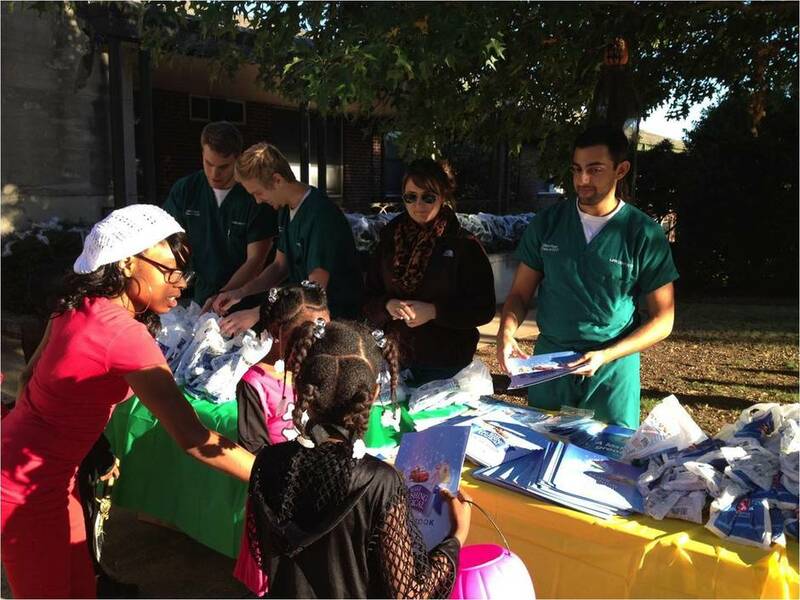 University of Alabama dental students recently participated in a "Halloween on the Hilltop" for Birmingham's disadvantaged children. Each child was provided a "Smile Kit" , donated by Children's Healthy Smile Project. The dental students also provided information on healthy oral hygiene. Pictures are from prior events. University of Alabama dental students packing "Smile Kits." Distribution of the "Smile Kits" to the children. Over 700 "Smile Kits" were given out during the event. A good example of giving back to the community. Children's Healthy Smile Project served approximately 1,000 needy children during February, Children's Dental Healthy Month. Locally, 240 preschool children received "Smile Kits". Also their parents were invited to attend a special meeting to meet a local pediatric dentist and her staff who provided a informative presentation on dental disease prevention for their children. In Key West, Florida, 540 children attending a local school received "Smile Kits". Several classrooms received a personal visit to stress the importance of brushing and flossing. In addition, several local organizations serving low-income and homeless women and children were given "Smile Kits" and educational materials. Another successful "Halloween on the Hilltop" project by the University of Alabama Dental School. Great Job!! Children's Healthy Smile Project provided approximately 600 "Smile Kits" for distribution by the students. CHSP's Florida Keys Director, Joyce Milelli, visites a classroom for Children's Dental Health Month. Joyce spoke to the students about healthy oral hygiene. "Smile Kits were distributed to several schools and agencies serving low income children in the Florida Keys. Additionally, teaching aids were given to schools to assist teachers when instructing students on proper brushing and flossing. This project was entirely supported by the citizens of Key West and the Florida Keys.